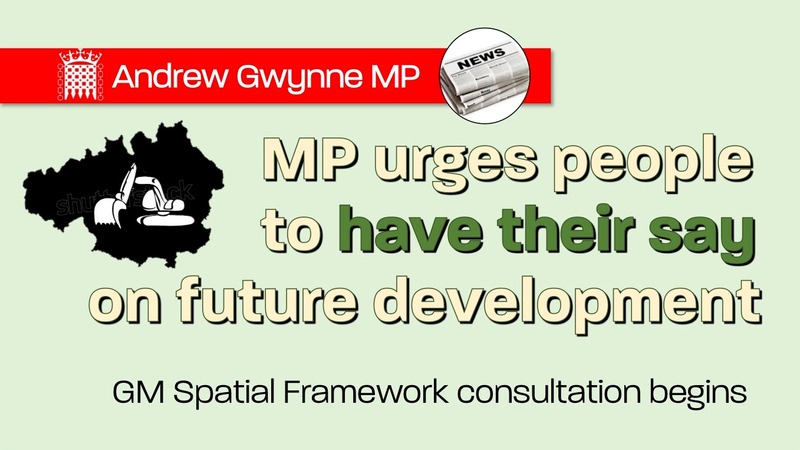 Denton and Reddish MP, Andrew Gwynne, has urged constituents across Tameside and Stockport to have their say on the Greater Manchester Spatial Framework through the official consultation which is now open. The new spatial framework is an attempt to make the most of Greater Manchester’s brownfield sites, prioritising redevelopment of town centres and other sustainable locations. It will also help to address the housing crisis with a minimum target of 50,000 additional affordable homes – 30,000 of which will be social housing. The plans were initially introduced in 2016 and received a great deal of opposition, especially in regards to the loss of green spaces. In the autumn, the MP joined forces across-party with Hazel Grove Conservative MP, William Wragg, to present a large petition to Parliament opposing the Bredbury Parkway industrial estate extension . The initial opposition centred on the loss of Green Belt land. The land in question is located in the V of the valley, so any industrial development will be terraced and so very difficult to screen. As such it would completely destroy the openness of this part of the Tame Valley as well as destroying the visual amenity from the Haughton Dale and Hulme’s Wood Local Nature Reserves; both on the Denton side of the river. Since then the plans have been rewritten with some changes which have seen reductions in the loss of the greenbelt. However there are still very real concerns over the revisions which argue that the plans are still too greenbelt focused, particularly in relation to new commercial space. Gwynne is now encouraging all constituents to voice their opinion on the redevelopment plans through the open consultation which runs through to Monday 18 March, 2019. “The revised Spatial Framework is certainly in better shape than the original draft, however the revisions are still too greenbelt focused, particularly in relation to new commercial space which is why I remain opposed to this scheme. “As it stands the plans will completely destroy the openness and ambience of the Tame Valley at the Haughton Dale and Hulme’s Wood Local Nature Reserves in my constituency.